Creativity in CAS provides students with the opportunity to explore their own sense of original thinking and expression. Creativity will come from the student’s talents, interests, passions, emotional responses, and imagination; the form of expression is limitless. This may include visual and performing arts, digital design, writing, film, culinary arts, crafts and composition. Students are encouraged to engage in creative endeavours that move them beyond the familiar, broadening their scope from conventional to unconventional thinking. The aim of the “Activity” strand is to promote lifelong healthy habits related to physical well-being. Pursuits may include individual and team sports, aerobic exercise, dance, outdoor recreation, fitness training, and any other form of physical exertion that purposefully contributes to a healthy lifestyle. Students are encouraged to participate at an appropriate level and on a regular basis to provide a genuine challenge and benefit. The aim of the “Service” strand is for students to understand their capacity to make a meaningful contribution to their community and society. Through service, students develop and apply personal and social skills in real-life situations involving decision-making, problem-solving, initiative, responsibility, and accountability for their actions. 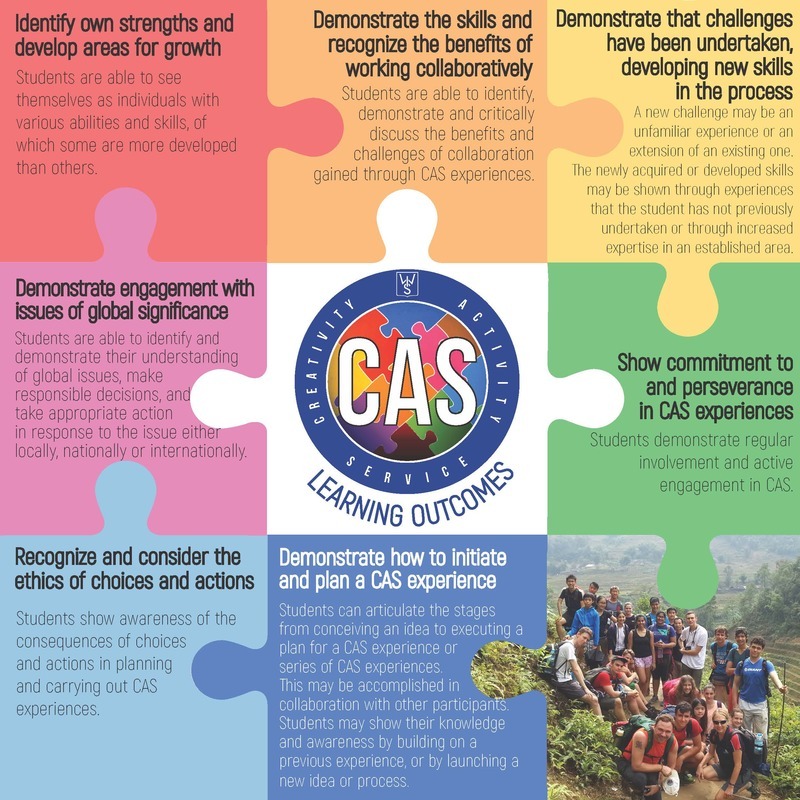 Service is often seen as one of the most transforming elements of CAS by promoting students’ self-awareness, offering diverse occasions for interactions and experiences and opportunities for international-mindedness. Service within CAS benefits all involved: students learn as they identify and address authentic community needs, and the community benefits through reciprocal collaboration. Service fosters development of abilities, attitudes and values in accordance with the IB mission statement and the IB learner profile. As such,CAS service experiences are unpaid. Reflection is the essential process that allows students to learn from their experiences. Reflection is the self-appraisal of goals and achievements and provides the opportunity to document feelings and healthy self-criticism, a vital part of the CAS process. Students will use their CAS Portfolio (Datahub; online reflective tool) to record their aims, goals, participation and reflections. The IB require Diploma students to demonstrate that they have achieved the following outcomes across their two year programme.